Home of the Objibways of Pic River First Nation, Pic River is a small community of about 400 people southeast of Marathon. You’ll have to detour south on road 627 off the TransCanada. Apparently, the mouth of the Pic River was a trading spots for years before European arrival as it offered access to northern lands and a canoe route to James Bay. The halfway point for canoers travelling the north shore of Lake Superior, “the Pic” first appeared on European maps in the mid-seventeenth century (according to Wikipedia). First Nations began to trade furs with the French in the late 1770s, prompting a French trader to set up a permanent post there by 1792. The Hudson’s Bay Company operated the post from 1821 until encroaching settlement let to its relocation in 1888. In 1914 the Pic became a treaty reserve of its traditional inhabitants, the Ojibways of Pic River. Pic River used to be a railway town, but with the trains diminishing in importance, forestry and hydro are the town’s mainstays. According to Wikipedia, the town is known for pioneering “run of the river” hydroelectric developments, which harness natural energy potential without fully damming the river. In and around Pic River, three generating stations feed enough hydro into the Ontario grid to power 30 000 homes. 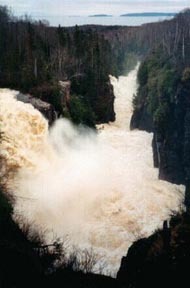 Pic River can serve as an access point to Pukaskwa National Park. The town also had a number of unique sandy dunes where the Little Pic River reaches Lake Superior. Pic River hosts their annual pow-wow July 12-14. I did not venture off Highway 17 (I was in a rush and just how long this detour was really started to hit me after Marathon) so if you want to add to this page, please let me know by emailing me. My address is info (at) highway11 (dot) ca. Terrace Bay is a town of 2000 on Highway 17 and the last major town until Marathon. It is about two hours east of Thunder Bay. Terrace Bay is named for a number of underwater terraces carved by glacial movement in Lake Superior. Companies noticed that Terrace Bay was a good place for hydro and paper development, and in the 1940s Kenogami and Aguasabon Rivers were diverted to power a new town built in 1947. 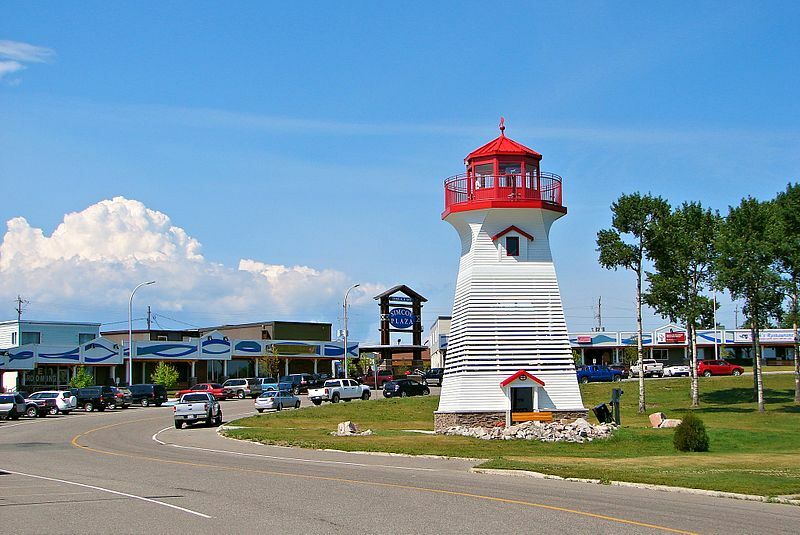 Terrace Bay is a ‘model town’ like Kapuskasing that was supposed to be a model for future urban development. Unfortunately for Terrace Bay, its status as a model for the rest of the country was short-lived as it never really grew out of its original plans as a company pulp and paper town. Terrace Bay seems pretty neat although I did not stop in for a visit. Slate Island is one of the most interesting features is nearby. 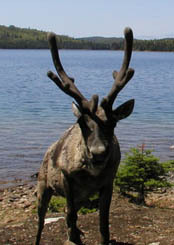 Just outside of Terrace Bay in Lake Superior, Slate Island is uninhabited by humans but habited by its own herd of caribou. This isolated population comes under much study by naturalists and researchers. You can visit Slate Island Provincial Park, replete with caribou, and a little lighthouse via an arranged boat tour. Aguasabon Falls is also just outside of town, you can visit the roaring waters and the gorge at the local provincial park. There is a local beach, canoeing, swimming, and fishing in the area. The town hosts an annual dragfest in August and a Fall Fair in September. For golfers, there is the Aguasabon Golf Course and for hikers Terrace Bay is the end of the 47 kilometre Voyageur hiking trail that links it to Rossport and Schreiber. Terrace Bay is sort of a low-to-medium size for a northern Ontario town. There is the Red Dog inn, the Coach House and Imperial motels, a home hardware, a family food market, a mini Pizza Hut, a few shops, and some gas stations. Roy’s serve pizza and subs while Wah’s serves Chinese, although I don’t know if it’s true Northern Ontario Chinese Food or not. I don’t know if there is a mall or not – if not, you can hit Marathon about an hour and a bit to the east. There is an A&W in town, I’ve read about the Northern Lites diner serving a good breakfast. It is supposedly located next to the municipal bureau and the local Amethyst Monument. Terrace Bay is essentially the last pretty coastal town on Highway 17. 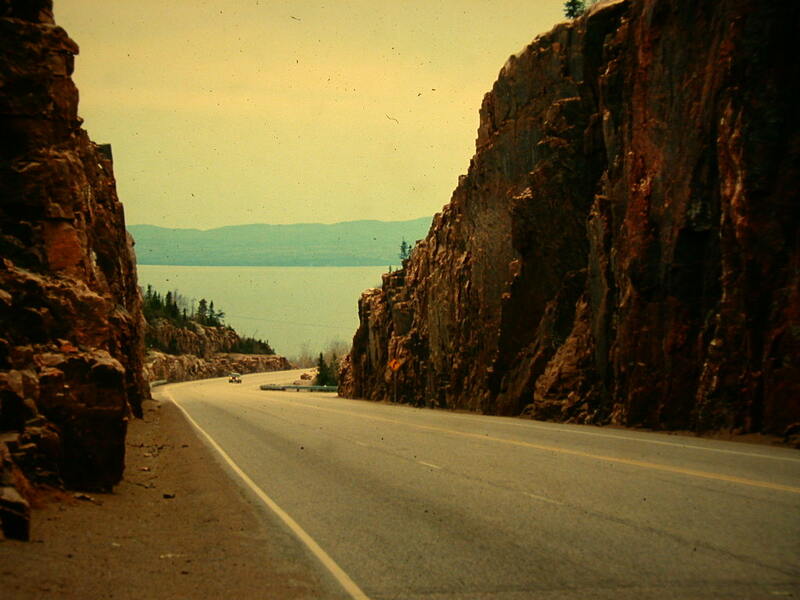 After this the highway moves inland and the views subside. 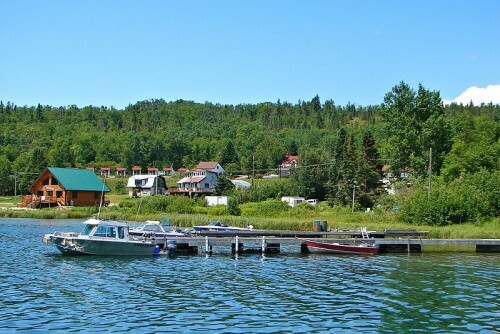 Enjoy towns like Rossport, Schreiber, and Terrace Bay while you can. Rossport is a little hamlet of 200 people nestled between Lake Superior and the Transcanada Highway 17. 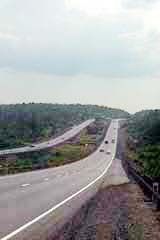 While it started out as small settlement known as McKay’s Bay, like many of the other towns on this stretch of Highway 17, Rossport was truly built for the railway and named after an engineer that helped build the CPR. The town became an important fishing centre after the railway arrived in 1885, and was even served by a luxury steam liner which sank nearby in 1911. Today Rossport is a small community which grows in the summer with cottagers and outdoorists. 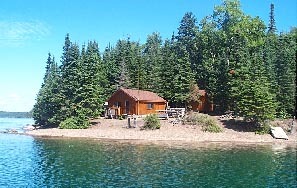 There is camping in Rainbow Falls Provincial Park, which also has hiking trails, a waterfront boardwalk, and access to both Whitesand Lake and Lake Superior. Interpretive programs are available on Saturdays and Sundays in the summer at the Park. The Rossport Inn (click here for reviews) is the highlight of the town – originally built in the 1880s to serve the railway, today the inn serves meals and acts as a bed and breakfast. I’ve read about it online and in print, so it looks like it is worth visiting if you’re passing through. 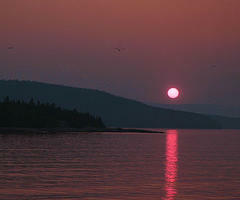 There is talk of creating a Lake Superior Marine National Park, which would encompass parts of the Rossport Shoreline. Cavers is a small town on Highway 17 about 50 minutes east of Nipigon. While I remember passing a sign that said Cavers, I don’t really remember much. I assume the town is slightly south of the Transcanada. The Gravel River Provincial Nature Reserve is just a bit west of town on the shore of Lake Superior. Unless you need gas immediately, I’d wait until Schreiber to get off Highway 17. If you have any information or any photos, please send them my way. My email is info (at) highway11 (dot) ca.